The very term ‘Aztec’ has a mythological lineage since it is derived from Aztlan (or ‘Place of Whiteness’ in connotative meaning), the mythical place of origin for the Nahuatl-speaking culture. According to one version of their legacy, it was the Toltec warlords who pursued the Mexica (one of the warlike Mesoamerican people who later formed the Aztec Triple Alliance or Aztec Empire) and forced them to retreat to an island – a precarious endeavor made successful by the guidance of their patron god Huitzilopochtli, the Hummingbird of the South. And it was on this island that they witnessed the prophecy of “an eagle with a snake in its beak, perched on a prickly pear cactus” – which led to the founding of the massive city of Tenochtitlan in circa 1325 AD, by ‘refugees’. As for the historical side of affairs, the various Aztec gods, goddesses, and the related pantheon were adequately similar to previous and contemporary Mesoamerican cultures (including Maya), albeit with a few exceptions that were intrinsically Mexica. 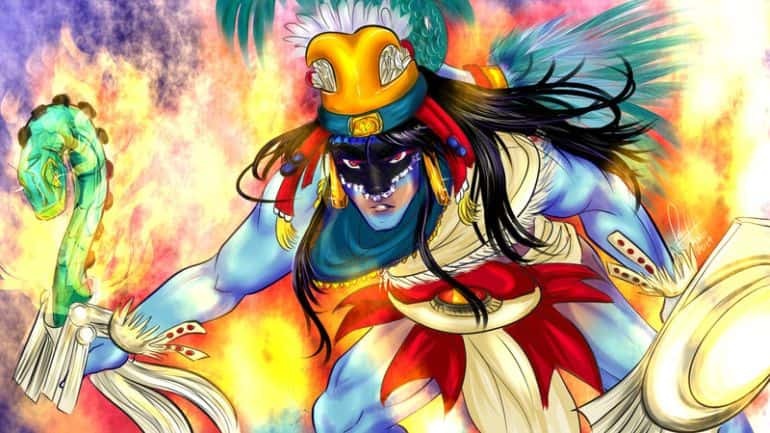 Taking such cross-cultural influences into consideration, let us take a gander at 12 major Aztec gods and goddesses you should know about. Like most mythologies, the Aztec pantheon was also ‘topped off’ with a primordial god. Known as Ometecuhtli, this primeval divine being of fertility was perceived as a dual entity representing both male and female, and as such the name in Nahuatl pertains to ‘Two Lord’ or ‘Lord of Duality’ (also known as Omecihuatl or ‘Two Lady’). In essence, Ometecuhtli (or Ometeotl) espoused the antithetical factors of nature, with the masculine and feminine sides representing the light and dark, chaos and order, and even in some respects good and evil. In the Aztec creation story, Ometecuhtli was self-birthed, and as such the androgynous being’s dual genders acted as husband and wife to give birth to the other four major Aztec gods – Huitzilopochtli, Quetzalcoatl, Tezcatlipoca, and Xipe Totec, who in turn represented the four cardinal sides. As for the historical side of affairs, unlike most other Aztec gods and goddesses, Ometecuhtli had no temple erected in his honor. The lack of any formal cult is possibly explained by the Aztec belief system that placed Ometecuhtli in the 13th heaven (symbolically, the highest plane) that made the entity ‘disconnected’ from the affairs of the ‘lower’ Aztec gods and mortals. Counted among the most important of Aztec gods (and Mesoamerican divine entities), Quetzalcoatl, regarded as the son of the primordial god Ometecuhtli, was venerated as the creator of mankind and earth. 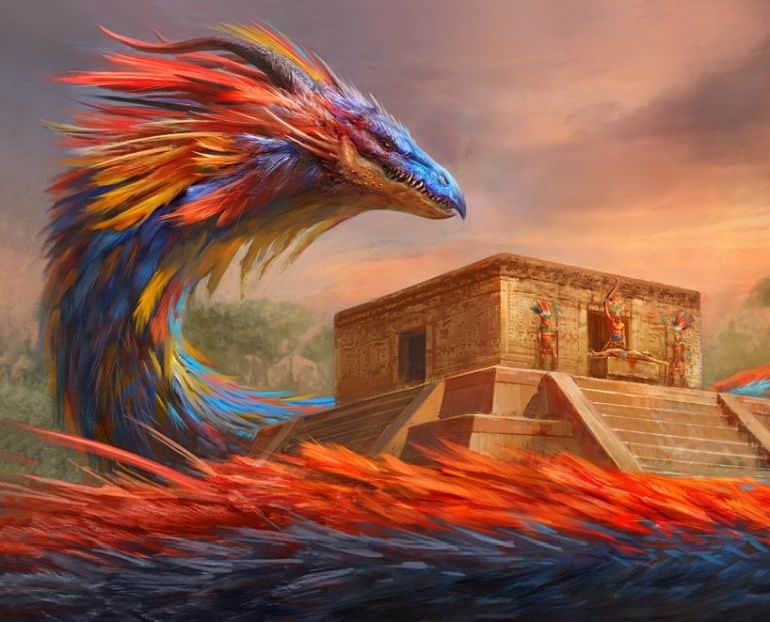 Also known as Kukulkán to the Maya and Gucumatz to the Quiché (of Guatemala), etymologically, the very name ‘Quetzalcoatl’ comes from the combination of the Nahuatl words for the quetzal – the emerald plumed bird, and coatl or serpent. 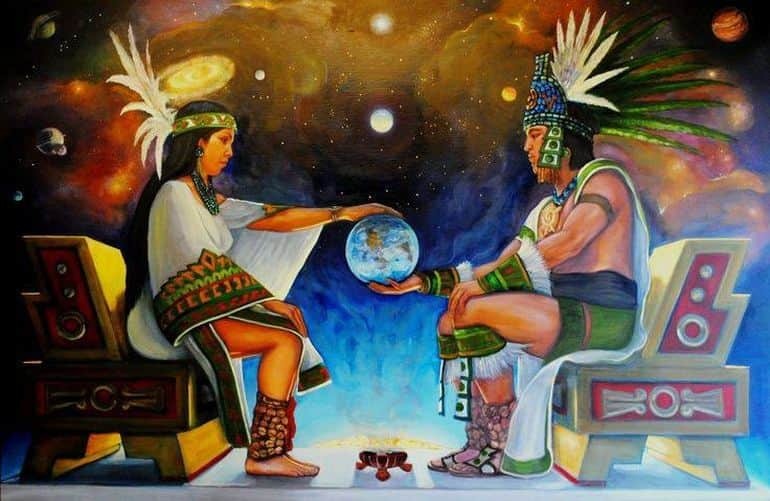 As for his aspects, often considered as the Aztec god of wind and rain, Quetzalcoatl also espoused a variety of avenues like science, agriculture, crafts and even merchants. In one version of the Aztec creation myth, the world was created and destroyed for four times (each age associated with the sun), with some of the tumultuous episodes being borne by the fighting between Quetzalcóatl and his brother Tezcatlipoca. 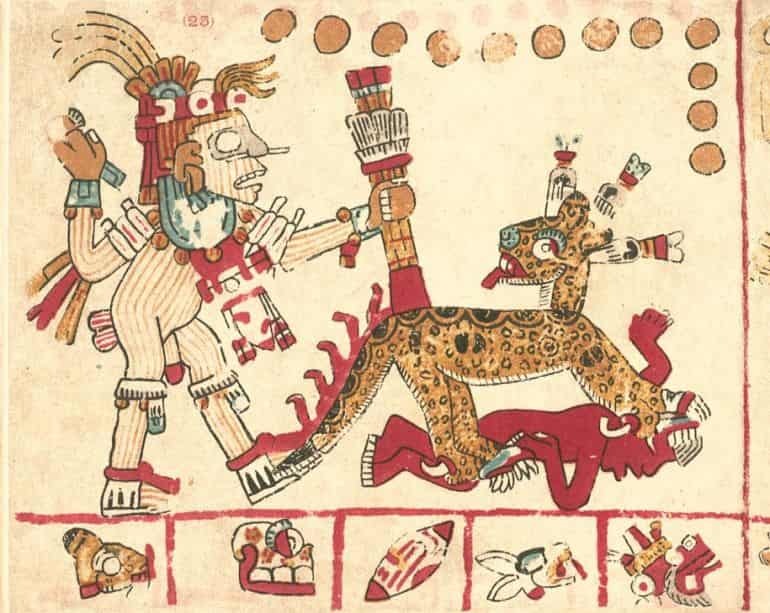 Ultimately during the Fifth Sun, Quetzalcóatl was successfully able to retrieve the human bones from the underworld Mictlan (guarded by the realm’s ruler – Mictlantecuhtli) that were infused with his own blood and corn to once again ‘regenerate’ mankind. In another myth, the god along with his brother Tezcatlipoca fashions the earth out of Cipactli, a female serpent-like monster. Consequently, her hair and skin give way to trees and flowers, while her eyes and nose account for the caverns and springs. However, given the violent loss of her physical form, the monster (now embodying the earth) thirsts for blood and hearts – thus alluding to the grisly practice of human sacrifice. As for the historical side of affairs, the Feathered Serpent, in spite of his initial ‘hybrid’ characteristics, was usually depicted (post circa 1200 AD) in a human form who usually is adorned in shell jewelry and wears a conical hat (copilli). The lord of the nocturnal sky and the eternal antithesis of his brother Quetzalcóatl, Tezcatlipoca, among the major Aztec gods and goddesses, is also sometimes credited as being the co-creator of the world. 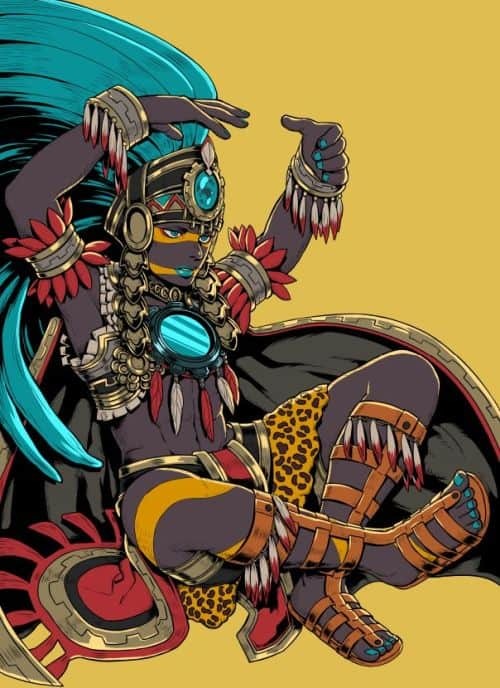 Pertaining to this role, according to one version of the mythical narrative, Tezcatlipoca sacrificed his own limb when he baited it for the female serpent monster Cipactli. And thus he was given the honorific title of Ipalnemoani – ‘he by whom we live’. The very name Tezcatlipoca translates to ‘Smoking Mirror’ in Nahuatl, which suggests his connection to the obsidian. The Aztec god was also associated with a range of various concepts, including north, hurricanes, war, rulership, eternal youth, divination, sorcery, and jaguars. Coming to history, the figure of Tezcatlipoca was possibly inspired by earlier Mesoamerican deities, including the Mayan Tohil. In any case, he was one of the major Aztec gods in the later pantheon whose temple was situated south of the Great Temple in Tenochtitlan, while his main festival – the Toxcatl ceremony, was celebrated in the month of May. Considered as one of the major Aztec gods, Huitzilopochtli was also the supreme deity of the Mexica people (whose nobles later formed the Aztec Empire). In essence, as opposed to many other Aztec gods and goddesses, Huitzilopochtli was intrinsically a Mexica deity rather uninfluenced by earlier Mesoamerican divine entities. 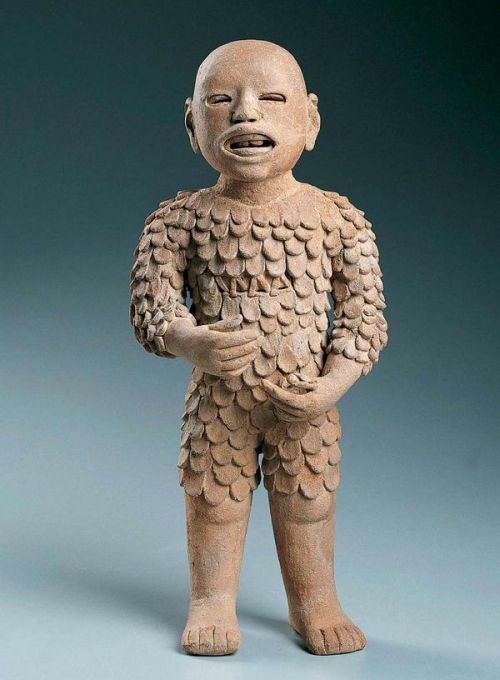 He was considered as the god of the sun and war, attributes which elevated him to the position of the patron deity of Tenochtitlan itself (by early 15th century), thus intrinsically tying up the ‘hunger’ of gods with the Aztec penchant for ritual war. Taking cues from the mythical narrative, Aztecs interpreted the ‘sibling rivalry’ between Huitzilopochtli and his sister Coyolxauhqui as the tussle between the sun and the moon for the control of the sky. This nature of the conflict was also epitomized by Huitzilopochtli association to warfare – and as such, he was accompanied by his entourage of fallen warriors (whose spirits returned to earth as hummingbirds) and women who died during childbirth (which was perceived as an act of bravery). As for the historical side of affairs, Tenochtitlan was the focal point of Huitzilopochtli worship, with the capital city housing the shrine and wooden statue of the Aztec god (atop the Temple Mayor). Incredibly enough, the steps leading to Huitzilopochtli’s own temple, on the south side, was painted in gaudy red to signify the essence of blood and war. A deity of agricultural renewal, vegetation, seasons, goldsmiths, and liberation, Xipe Totec was counted among one of the major Aztec gods and goddesses. And while his related concepts and powers seem fairly innocuous, the worship (and its mode) of Xipe Totec was anything but. This is somewhat discerned from his ominous name roughly meaning – ‘our lord with the flayed skin’. The Nahuatl moniker comes from the mythical narrative where the Aztec god flayed his own skin to feed humanity, thus symbolizing how maize sheds its outer skin cover before germination (‘rebirth’). Suffice it to say, with the imagery of flayed skin and also the cult of death (and rebirth) associated with Xipe Totec, the Mexica people tended to venerate this Aztec god with human sacrifices – mostly carried out during the March festival of Tlacaxipehualiztli (meaning ‘flaying of men’). One of the popular modes of sacrifice involved the mock gladiatorial combat where the prisoner (chosen on account of his bravery) was tied to a stone and handed a ‘fake’ macuahuitl with feathers instead of sharp obsidian blades. He had to (hopelessly) fend off an experienced Aztec warrior/s fully armed and armored. After his ‘glorious’ death, his skin was ritually flayed, painted yellow, and worn by reenactors of Xipe Totec (usually slaves), who were then worshipped and treated as gods by the local people. Annually, a quota of slaves and captured warriors was also selected for sacrifice. And after their hearts were cut out, their skins were worn by Aztec priests for 20 days, often bedecked with bright feathers and gold jewelry. On the completion of the festival period, the priest shed the rotting flayed skins, thus once again symbolizing the rebirth aspect of Xipe Totec. 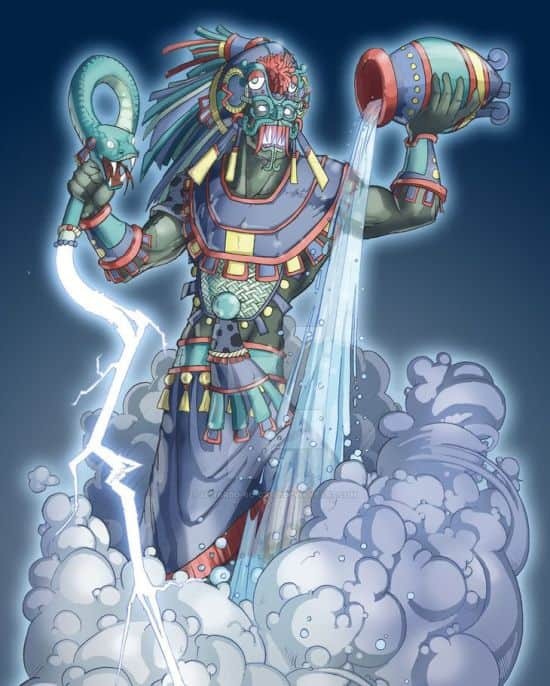 The supreme deity of rain, Tláloc was considered as an enigmatic entity among the major Aztec gods and goddesses, especially with his early representations (from circa 3rd to 8th century AD) that entailed a masked divine being with large round eyes and extending fangs, possibly inspired by the contemporary Maya god Chac. With his association with rain and consequent fertility, Tláloc was probably worshipped as a beneficent Aztec god. However, like some other entities in the Aztec mythology, he was also depicted with a dual aspect, and this ‘dark’ side pertained to his ability to bring forth thunder, hail, and storms. Now judging by the aforementioned timeline, it is safe to assume that Tláloc and his cult was one of the oldest in Mexico, possibly centered around the mysterious origins of the city of Teotihuacan (not to be confused with Tenochtitlan). As for the symbolic side of affairs, given his association to rain and water, Tláloc was often correlated with caves, springs, and mountains, most specifically the sacred mountain in which he was believed to have his abode. 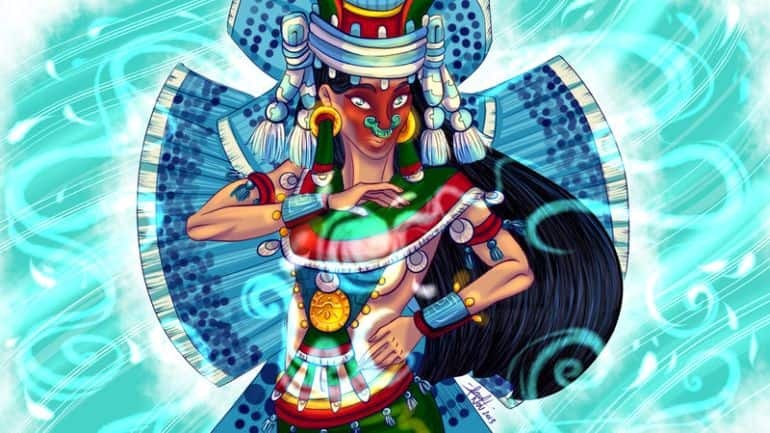 The Aztec goddess of ‘collected’ water on earth, thus embodying rivers, lakes, and oceans, Chalchiuhtlicue was considered as the female (protector) deity of navigation, childbirth, and newborn babies. Given her association to water, Chalchiuhtlicue was often related to Tláloc, one of the major Aztec gods of rain and thunder. Interestingly enough, in that regard, she was often venerated as the wife (or sister) of Tláloc, while in some cases, she was even worshipped as the feminine form of Tláloc himself. 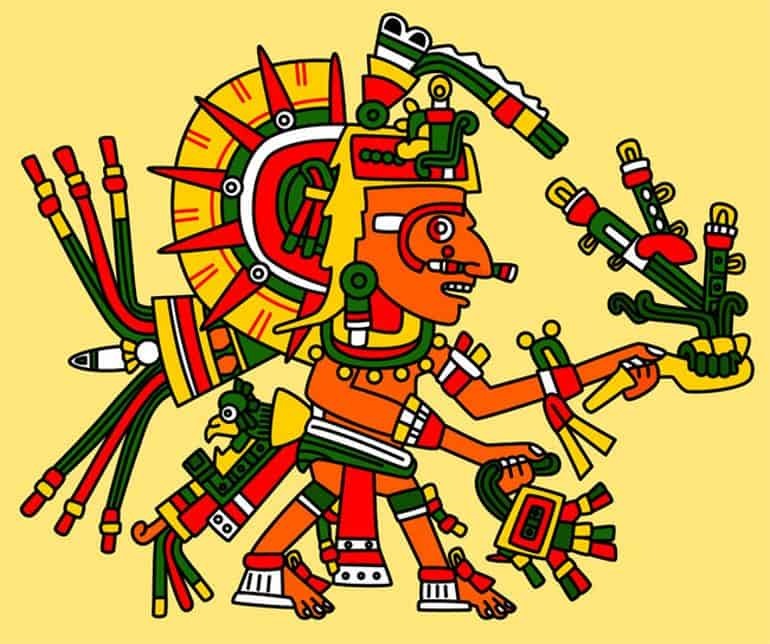 In the narrative of the Aztec lore, Chalchiuhtlicue plays a crucial role in the Mexica version of the deluge myth, as she is the one to bring forth the cataclysmic flood and destroy the world of the Fourth Sun (the world of the Fifth Sun is once again populated by humans due to the efforts of Quetzalcoatl – discussed earlier in the article). However, in spite of her seemingly harsh aspect, she does her bit to save the life essence of humans by transforming them into fishes. As for the historical side of affairs, Chalchiuhtlicue was an important Aztec deity in a time period as late as the 16th century. Her festival coincided with the month of February (at the commencement of the rains), usually involving various rituals, like fasting, feasting, bloodletting, and brutal episodes of human sacrifice (that even included women and children). The deity of the hunt, Mixcoatl, among the major Aztec gods, has a pretty complex history in the mythical narrative. This partly has to do with the shared origins of Mixcoatl, who was also known as Camaxtli (roughly translating to ‘without deer sandals’), and was venerated in earlier and contemporary Mesoamerican cultures like the Otomi, the Chichimecs, and the Toltecs. Most of these cultures, along with the Aztecs, also tended to associate the lord of the hunt with the Milky Way, the stars, and the heavens. Interestingly enough, while in the Aztec pantheon, Mixcoatl played a secondary role to Huitzilopochtli, he was sometimes worshipped as the ‘red’ aspect of Tezcatlipoca (‘The Smoking Mirror’), an entity responsible for striking the first fire with flint. 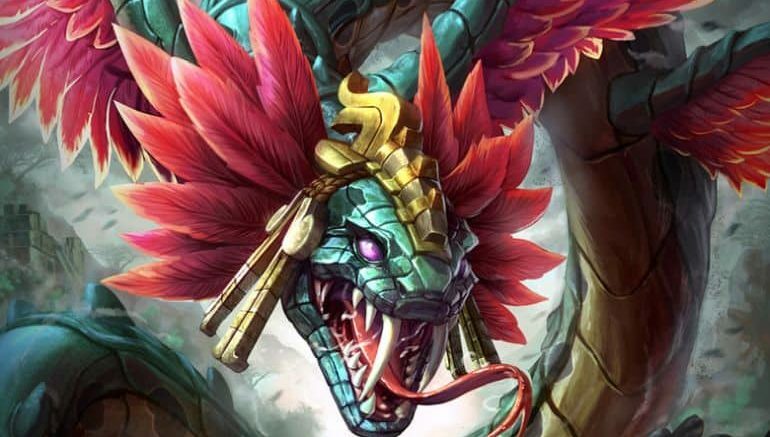 In another instance, Mixcoatl is mentioned to be the father to Centzon Huitznahua (400 entities that tried to kill Huitzilopochtli’s mother but ended up having their hearts eaten by the god of war) and also Quetzalcoatl. As for his worship, Mixcoatl was venerated during November (Quecholli – the 20th Aztec month), with the festival entailing hunters dressed up like the god engaging in hunting, roasting games, and feasting. Venerated as the ‘mother of gods’, Coatlicue among the major Aztec gods and goddesses, was also mythically regarded as the feminine entity that gave birth to the stars, moon, and Huitzilopochtli (the patron god of sun and war). Furthermore, two different Aztec goddesses – Tocih “our grandmother”, and Cihuacóatl “snake woman” (who was worshipped as the patron goddess of women who died during childbirth) were perceived as the aspects of Coatlicue herself. In essence, all of these narratives place her as the supreme matronly goddess of the Aztec mythology that nourishes with her feminine capacity (as opposed to the abstruse nature of double gender presented by Ometecuhtli, the primordial entity among the Aztec gods). When it came to her depiction, as the name ‘Serpent Skirt’ suggests, Coatlicue was represented with her skirt made of writhing, interwoven snakes (possibly alluding to fertility) and drooping breasts (that suggested her pregnant state). On the symbolic level, she was also seen as the embodiment of earth – however, with dual characteristics – that of a loving, nourishing mother and of an insatiable force that required the lifeblood of its hosts. Among the major Aztec gods and goddesses, Xochiquetzal (also known as Ichpōchtli – meaning ‘maiden’) was a feminine deity of beauty, sexual love and power, fertility, and arts and crafts. 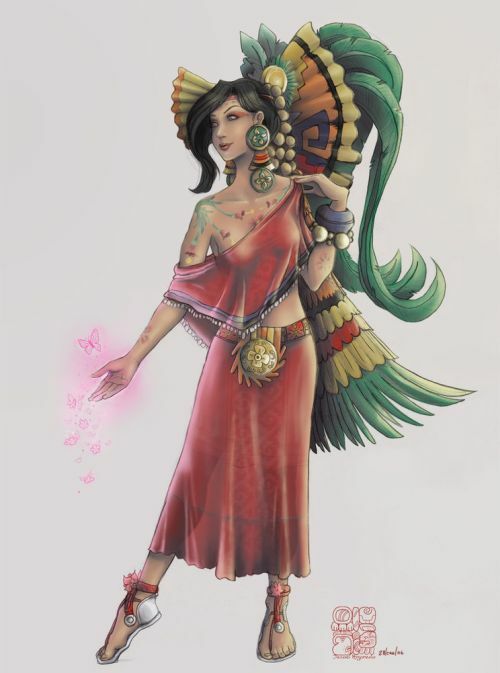 Interestingly enough, as opposed to other Aztec gods, Xochiquetzal had pretty straightforward depiction in the mythical narrative, as she was often represented as an attractive, youthful woman who was dressed in her exquisite attire bedecked with flowers and followed by a vibrant retinue of birds and butterflies. Talking of the mythical narrative, according to most versions, Xochiquetzal was originally the wife of rain god Tláloc but was later abducted and forced to marry Tezcatlipoca, the god of the night. Incredibly enough, it was the latter who elevated her to the position of the goddess of love – thus somewhat mirroring a political rivalry between the major Aztecs deities. In any case, beyond her powers of sexuality, Xochiquetzal was also venerated as the patroness of young mothers, pregnancy, weaving, and embroidery. Among the major Aztec gods and goddesses, Mictlantecuhtli was the deity of death and the underworld and was usually associated with creatures like owls, spiders, and bats (along with the direction of the south). In the mythical narrative, as we fleetingly mentioned before (in the Quetzalcoatl entry), Mictlantecuhtli played his role in delaying the Feathered Serpent from gathering the bones of humans in his underworld realm Mictlán. And it was only after Quetzalcoatl tricked him that humanity was ‘revived’ from bones and blood of the gods. Now as the Aztec god of death, Mictlantecuhtli was perceived as the singular entity that all human souls had to encounter, regardless of their righteousness or immorality. The only souls exempt from the arduous journey into the underworld (located at the deepest level) were the ones who had died a violent death, either from childbirth or from storms and floods. 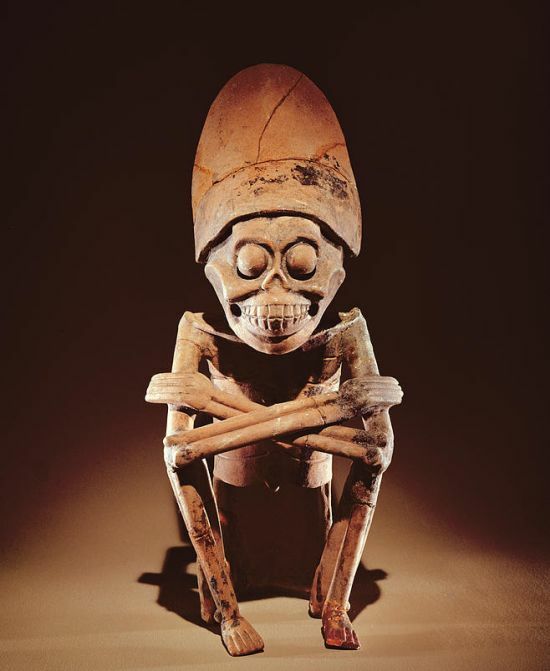 As for his depiction, Mictlantecuhtli was often represented as a skeletal figure with blood spots or an ominous entity wearing a skull mask and necklace of eyeballs. 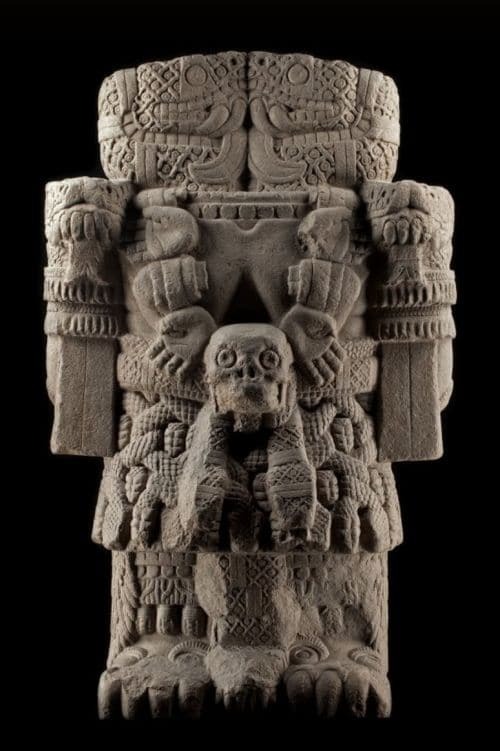 A fierce deity representing the Fifth Sun (the final era in Aztec mythology, i.e., the present age), Tonatiuh, among all the major Aztec gods and goddesses, was probably the one who was most associated with the act of ritual sacrifice. Essentially, in many Postclassic Mesoamerican cultures (circa 10th to early 16th century), including that of the Nahua-speaking Aztecs, the hearts of the sacrificial victims were perceived as the symbolic ‘nourishment’ for the sun. And Tonatiuh, as the sun, needed such nourishment so that he can defeat darkness on a daily basis to rise effulgently during the morning. This scope made Tonatiuh one of the Aztec gods of warriors in the Mexica society, as these soldiers were the ones tasked with defeating and rounding up prisoners of war – many of whom were chosen as sacrificial victims for the sun god. Over time Tonatiuh also became associated with the guardian deity who accompanied the spirits of the fallen warriors into the rigorous afterlife. Coming to the historical representation, Tonatiuh was often depicted as a symbolic sun disk (or sometimes a squatting man with an imposing disk on his back), with the motif being carved into the walls of monuments and temples.